For easy access and the ultimate protection against deer, install one of our driveway gates or driveway grates. Don't allow your driveway to be the weakest part of your fence enclosure! Make sure that deer won't get in with one of our Driveway Gates or Deer Grates! At Benner's Gardens, our 6' driveway gates are available in widths of 8' to 14' to fit virtually any home's driveway. 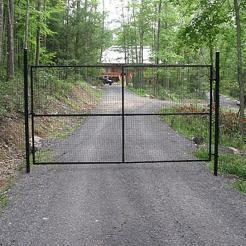 Add our driveway gate system to your deer fence and you'll have the ultimate in deer and animal protection. Our gates are made from high-quality tubular steel and come with all-black components to match your fencing system. You'll get extra protection for your property while enjoying easy access to your driveway. At Benner's Gardens, our 7' driveway gates are available in widths of 8' to 14' to fit virtually any home's driveway. 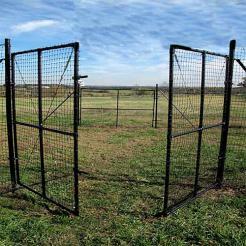 Add our driveway gate system to your deer fence and you'll have the ultimate in deer and animal protection. Our gates are made from high-quality tubular steel and come with all-black components to match your fencing system. You'll get extra protection for your property while enjoying easy access to your driveway. At Benner's Gardens, our dual driveway gate kits give you the ultimate in deer and animal protection. Our gates are made from high-quality tubular steel and come with all-black components to match your fencing system. You'll get extra protection for your property while enjoying easy access to your driveway. At Benner's Gardens, our 8' driveway gates are available in widths of 8' to 14' to fit virtually any home's driveway. Add our driveway gate system to your deer fence and you'll have the ultimate in deer and animal protection. Our gates are made from high-quality tubular steel and come with all-black components to match your fencing system. You'll get extra protection for your property while enjoying easy access to your driveway. All top surfaces are rounded to reduce the possibility of edges chipping away. 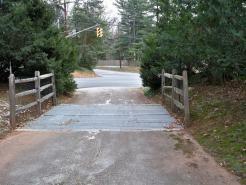 Deer Crossing Guards give you a gateless entry that you can drive over, but deer will not cross. Double sections are placed in a pre-excavated area which you prepare before delivery. The guards are precast 5000 PSI Steel Reinforced with all exposed surfaces rounded and easily installed on crushed stone or timber support beams. Grates are designed to last a lifetime without rusting or weakening. ALL GRATES ARE CONSIDERED A SPECIAL ORDER AND CANNOT BE RETURNED. FREIGHT CHARGES ARE QUOTED AT TIME OF ORDER AND ARE AT AN ADDITIONAL CHARGE.